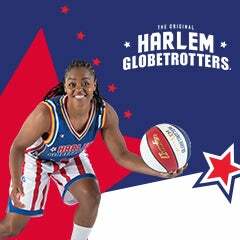 At each Globetrotters game, there will be over 20 opportunities before, during and after each event where fans will get a chance to directly interact with the team’s stars – that’s a 30-percent increase over any previous Globetrotters game. The Harlem Globetrotters roster showcases some of the most thrilling athletes in the world, including Big Easy Lofton, Ant Atkinson, Hi-Lite Bruton, Hammer Harrison, Thunder Law, Bull Bullard, Firefly Fisher and, Cheese Chisholm – plus female stars TNT Lister, Torch George and Hoops Green.# Prior to every performance, fans can secure a ticket to Magic Pass, the Globetrotters’ exclusive pregame event. Magic Pass gives fans unprecedented access to the stars of the team, an opportunity to learn tricks, shoot hoops and take pictures on the court. After each game, fans can participate in a free autograph session. * An additional exciting new element fans can look forward to this year is a new interactive mobile app with exclusive features, including an augmented reality (AR) basketball toss game and one-of-a-kind image filters that can be shared on social media.